Redding Reloading Equipment introduces new die sets in 6.5 PRC for 2019. They will be available in Type–S and Type-S Match Die sets for the most demanding handloading enthusiasts. Registration opens today (April 2) for Carnivore’s Hunter Games, a hunting competition where you can test your prowess in rifle shooting, wingshooting and archery - or simply choose the one you like best. The competition will be held September 20-22, 2019 at the Rockcastle Shooting Center in Cave City, Kentucky. The Civilian Marksmanship Program invites everyone to explore the remarkable world of air rifle competition, April 4-6, 2019, as hundreds of coaches, competitors and spectators arrive in the Sandy area for the 2019 CMP Three-Position Regional Air Rifle Championships, held at the Mountain America Expo Center. The United States Concealed Carry Association announced that its upcoming annual expo will include a special showroom devoted solely for responsibly-armed women. The Women’s Concealed Carry Showroom will allow attendees to try women-specific carry options with specific product and service recommendations for female firearms owners, shooters and instructors. Civilian Marksmanship Program staff members host its second annual CMP 5K Range Run & 1K Fun Run on Sept. 28, 2019, at the CMP Talladega Marksmanship Park. Sturm, Ruger & Company, Inc. (NYSE: RGR) proudly introduces four new Target models to the Ruger American Rimfire family. Constructed from stainless steel for superior aesthetics and corrosion resistance, all four rifles live up to Ruger's reputation for accuracy and rugged reliability. The SIG SAUER P320 XCOMPACT, now available in retail stores, is a modular, striker-fired, 9mm pistol that combines concealability with full-size XSERIES features. Performance Center announced that it has nine new models of M&P Shield M2.0 pistols that include a longer, 4 inch barrel and slides designed for red dot optics. For the first time ever, the Performance Center M&P Shield M2.0 is available with a slide cut for optics and ships with a red dot included, delivering a slim, red-dot ready concealed carry pistol. Barrett Firearms Manufacturing, Inc. announced that the REC10 is now available at dealers for civilian purchase. Barrett has spent many hours perfecting the semi-automatic 308 rifle and it's shipping now. DeSantis Gunhide introduces 13 holster fits for the H&K VP9-B. These include the #001 Thumb Break Scabbard, the #062 Apache Ankle Rig and more. After extensive testing, the Singapore Police Force has awarded the tender for the purchase of more than 6,000 GLOCK pistols to GLOCK Asia Pacific's distributor, W.H. Brennan & Co Pte Ltd.
FN America, LLC is pleased to announce that the company was recognized for its exemplary safety record by the South Carolina Manufacturer’s Alliance. Davidson’s announced it has added Shadow Systems with an intial focus on the MR918 series of pistols. The Shadow Systems MR918 is a multi-role 9mm pistol. Apex Tactical Specialties, the industry’s leader in the design, development and manufacture of aftermarket trigger kits for pistols, is seeking candidates for the position of CNC Machine Operator at their Peoria, Arizona facility. The Real Avid Smart Drive 90 is a master grade gunsmithing bit set featuring tool grade steel bits. The driver comes with a jeweler’s top handle for one hand adjustments and a bright, 360° COBB LED light to illuminate the work area with no shadows. Lyman Products announces A-Zoom StrikerCaps dry practice training aids. They are made without a rim and are equipped with a centering O-ring which grips the chamber walls and keeps the snap cap in place in the chamber. Viridian Weapon Technologies is now shipping the E Series red laser sight for the Mossberg MC1sc pistol. It fits the pistol without hampering concealability and can be purchased as a package from Mossberg or as an accessory from Viridian. MPX Handguards Available from Samson Mfg. The Samson narrow profile, M-LOK handguard for SIG SAUER MPX pistols and carbines is the answer for those wishing to replace their large factory handguard. Legacy Sports International (LSI) hosted Northern Exposure Sporting Group Inc. in Reno, NV on March 28 and 29. The Northern Exposure Sporting Group are the official rep group for the Legacy Sports Brands throughout Canada, providing comprehensive corporate and field sales support for HOWA, POINTER and CITADEL. Bear & Son Cutlery, manufacturer of premium made-in-the-USA knives, adds a new series of pocket knives to the 2019 lineup with Bear Branded Bone knives. On Monday, February 18, 2019 Tom Wondrash, National Director of the Scholastic Clay Target Program announced the launch of their “new and improved” SCTP Virtual Scoring Platform for SCTP teams across the country. GetZone.com’s latest original series, In the Hunt, is now live. This 25-part series serves to satisfy the outdoor enthusiasts’ growing appetite for more hunting content. Nikon introduces the new PROSTAFF P5, a continuation of that legacy wrapped up in a one-inch main body tube and a versatile 4x zoom ratio with a wide field of view and increased image detail throughout the magnification range. Daniel Defense has partnered with optics manufacturer Vortex to offer a deal to its customers. Customers will receive a free Vortex SPARC AR red dot sight with the purchase of any Daniel Defense AR pistol during the month of April. The April issue of Shooting Industry features articles, key takeaways and an expanded New Product Showcase derived from the industry’s annual trade event, the 2019 SHOT Show. Honor Defense announces a new website experience that lets customers design and purchase their own custom firearm online. Consumers have more than 900 possible variations, choosing from custom slides, different grip configurations in 10 different colors, different barrel and slide lengths, Tritium or stock sights, laser options and Manual Thumb Safety options. The National Shooting Sports Foundation and Orchid Advisors are pleased to announce that Davidson’s and Easy Bound Book are Silver sponsors of the 2019 Firearms Industry Compliance Conference. McMillan Fiberglass Stocks is excited to support the upcoming Guardian Long Range Competition. This first competition of the 2019 Guardian series will be held April 6-7 in Warrenton, North Carolina. Blaser USA makers ofshotguns like the F3 and the F16 have agreed to support the Scholastic Clay Target Program again in 2019 as a Platinum Sponsor. Mc3 Stocks is joining several top manufacturers in the precision shooting industry to support the upcoming Silent Night long-range shooting match. This event is to be held April 5-7 in Ninnekah, Oklahoma. Shooting USA covers the 2019 Shooting, Hunting, Outdoor Trade Show. Jim and John Scoutten and Chris Cerino run the aisles to report what’s making news in firearms, ammo, and accessories in a full hour of non-stop reporting. Today's feature is from our companion service, The Tactical Wire. The purpose of shooting is to hit; the speed you shoot is dictated by the accuracy required. With close large targets you can hammer shots home. As the distance increases, and/or target size decreases your shooting speed decreases, ensuring you get a hit. Your firing speed varies according to what weapon you’re firing. Learning how to shoot is about discovering what speed you can shoot and still maintain the accuracy necessary. Shooting is about hitting. Regardless of what and why you’re shooting, when you press the trigger it should result in a hit. A lot of people find this a hard concept to follow. But, if you maintain self-control, and shoot at the proper speed, every press can result in a hit. The key is not caring about how fast you shoot, but focusing on slowing down and getting hits. Eventually, and with plenty of practice – don’t forget dry practice – the speed you can shoot will increase. Trying to force yourself to become fast will never result in accurate speed. Slow down and get the hits. “Slow” is subjective. If the shots need to go into a six-inch circle then shoot slow enough that they all go inside, but at the same time you don’t need to put shots into a one-inch group. It’s all about regulating your speed. One of the drills I have students perform is on a target with three or four one-inch targets and one six-inch target. Students start by firing surgical shots on the small targets, then switch speed to hammer hits into the large target. After some of these we’ll switch order, starting with the large targets and rapid hits, then transitioning to the small targets. This drill teaches students to vary the speed of their firing based on the accuracy required. “Speed” is also subjective, depending on what weapon you’re firing. 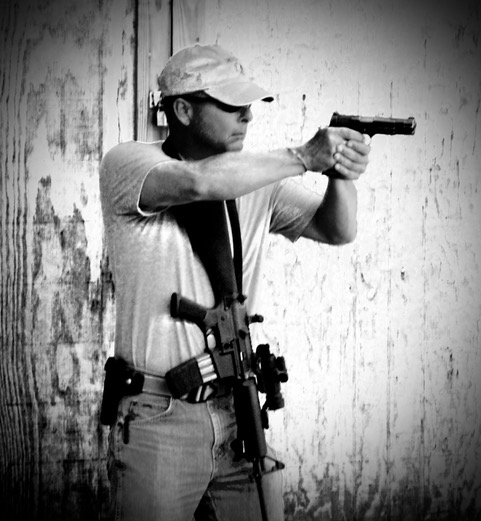 During Handgun/Carbine classes – working with pistol and carbine together – shooting speed must be regulated, and varied. You’re firing the carbine and it stops functioning. The most efficient way to get hits on target – as long as you’re within handgun distance – is to transition to the pistol. However, you’re not going to be able to fire the pistol, and get hits, at the same speed you were shooting with the carbine. Speed will vary according to what type pistol you’re firing – semi-auto vs. revolver. The ultimate factor again, the speed you shoot at, is dictated by the accuracy required. This all boils down to self-control. The only thing you can control is you, and the speed you perform. This speed, especially when it comes to shooting, must also consider the weapon you’re shooting. But regardless of what you’re firing when you do press the trigger it should result in a hit. Focus on the fundamentals – Aim, Hold, Press and Follow through. Practice at a speed that provides hits. Then the hard part in a defensive confrontation – if you’re required to shoot – is to not let the external, the fact that someone is trying to do violence against your or yours, dictate the speed you perform. The only way to do this is with plenty of practice, discovering your “speed.” This also creates confidence, which allows you to maintain control. Ultimately, confidence creates success.